Photographer David Hessell joined us on the Tuscany Untour a few years ago and brilliantly captured the region in the full flush of late summer. As we face a cold and drab January, here are some of his beautiful images. We like to think of sunflowers as nature’s antidepressant, a perfect foil for the short, dark days of winter. 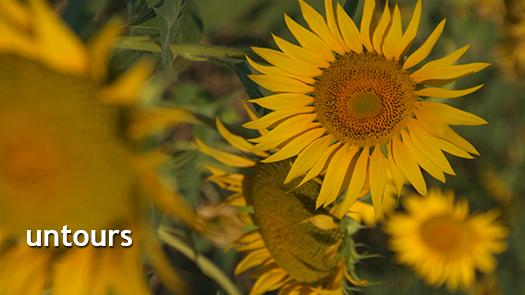 Peak time for sunflowers in the Val d’Orcia, where the Tuscan Untour is based, is in July. Fields filled with sunflowers peak in the summer heat. Sunflowers are grown for their seeds, to make oil. A sunflower can have up to 2000 seeds. It is said that the seeds of the sunflower grow in a spiral formation that follows the Fibonacci sequence. Sunflowers follow the arc of the sun as it makes its way across the sky. See Tuscany in summer for the best view of its sunflowers, when vineyards are lush with grapes sweetening on the vine and the sun sets after dinner.